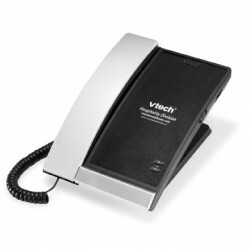 The VTech A2100 1-Line Contemporary Analog Lobby Phone is a one-line phone that makes it easy for your guests to interact with your hotel's services and staff. A customizable faceplate and the absence of dial pads and speed dials ensure you have total control over branding and call accounting. 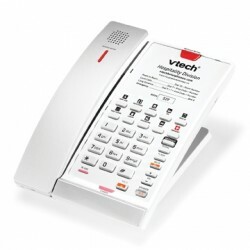 The VTech A2210 is a modern addition to any guest room, this one-line analog phone features corded comfort, elegant styling and antibacterial plastic. Since it's line-powered, your guests can always stay connected—even during power failures. 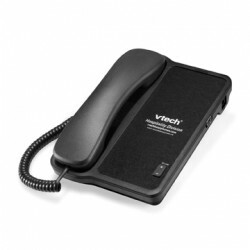 The VTech A1210 is both practical and affordably priced. This corded, one-line analog phone features traditional styling with straightforward functionality and ergonomic comfort to meet the needs of busy guests. The A1210 also features antibacterial plastic to protect guests and housekeeping staff from germs. 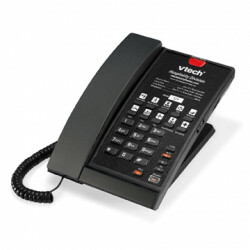 Make it easy for your guests to interact with your hotel's services and staff with this one-line, analog lobby phone. A customizable faceplate and the absence of dial pads and speed dials ensure you have total control over branding and call accounting. Provide your guests with a completely cordless in-room experience—plus the peace of mind knowing that their phones will work during a power outage. This 1-line analog cordless phone features a backup battery option that lets guests stay connected and even make emergency calls should the power go out. Provide your guests with a completely cordless in-room experience—plus the peace of mind knowing that their phones will work during a power outage. This 2-line analog cordless phone features a backup battery option that lets guests stay connected and even make emergency calls should the power go out.